This is something I’ve wanted to do for ages but I just never got around to it before now. In recipe books and magazines Shakshuka is usually pictured nestled comfortably as an individual portion in a nice cast iron pot with handles, and looks terribly luscious. Needless to say, as you’ll see, mine doesn’t look like that. Shakshuka or Shakshouka is Middle Eastern/Mediterranean in origin and several nations in that region claim it as their own. Well, whatever. That’s fine with me. 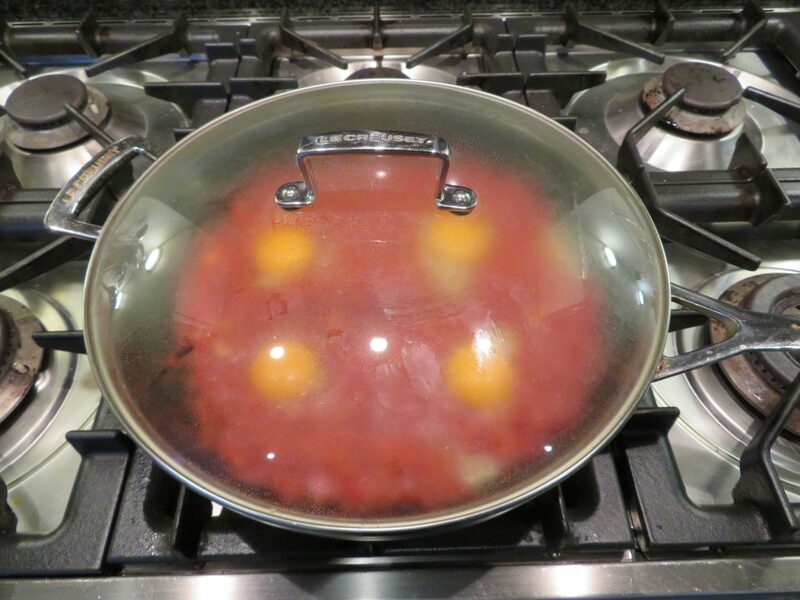 In essence, though, it’s eggs poached in a tomato sauce and it’s easy to make. And that’s all I need to know for this exercise. 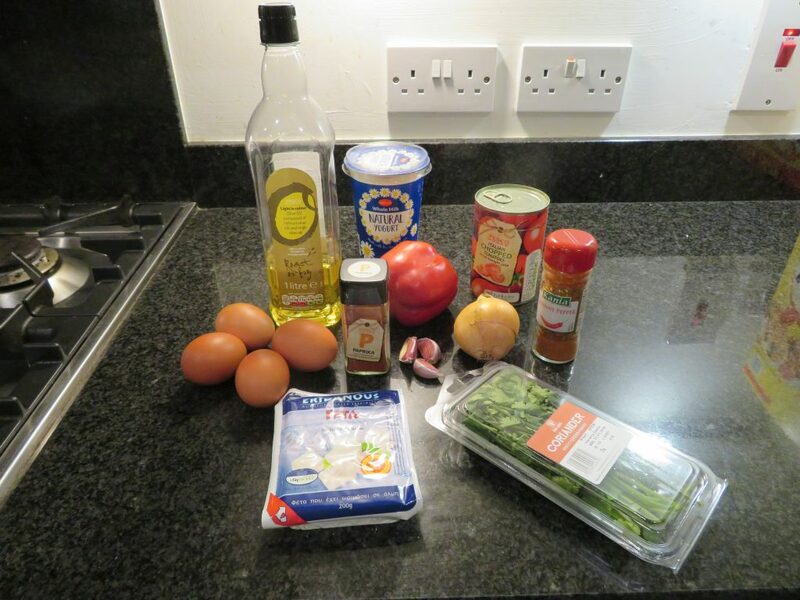 I had a few recipes for it at home, principally in Claudia Roden and Yotam Ottolenghi recipe books, but I found a Felicity Cloake article on the Guardian website entitled How to make the perfect Shakshuka. In her ‘How to make the perfect …’ series, she takes several recipes, evaluates them and comes up with what she feels is the best of all of them. That’s kind of how I cook anyway so this one suited me fine. 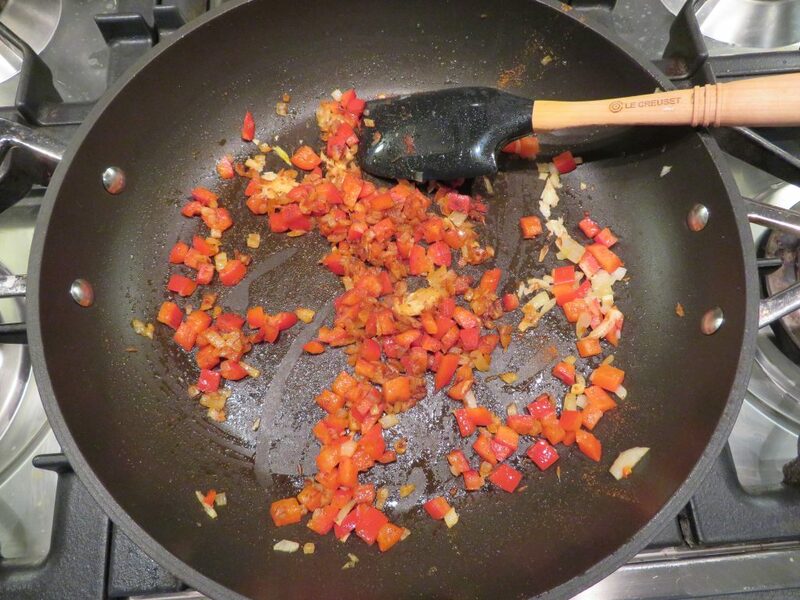 If you read the recipe, you may notice the absence of a green pepper. Two reasons for that. 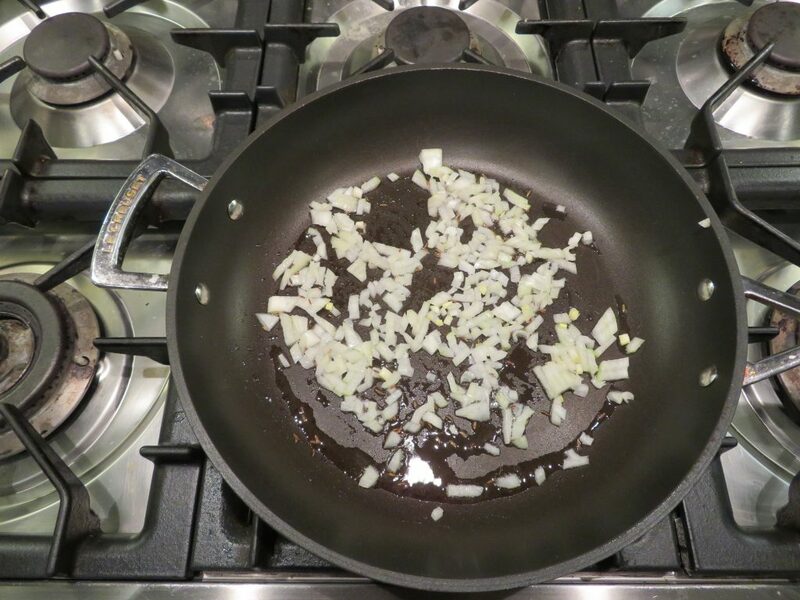 First, I’m not keen on the bitterness of cooked green peppers so I tend to avoid them when cooking. 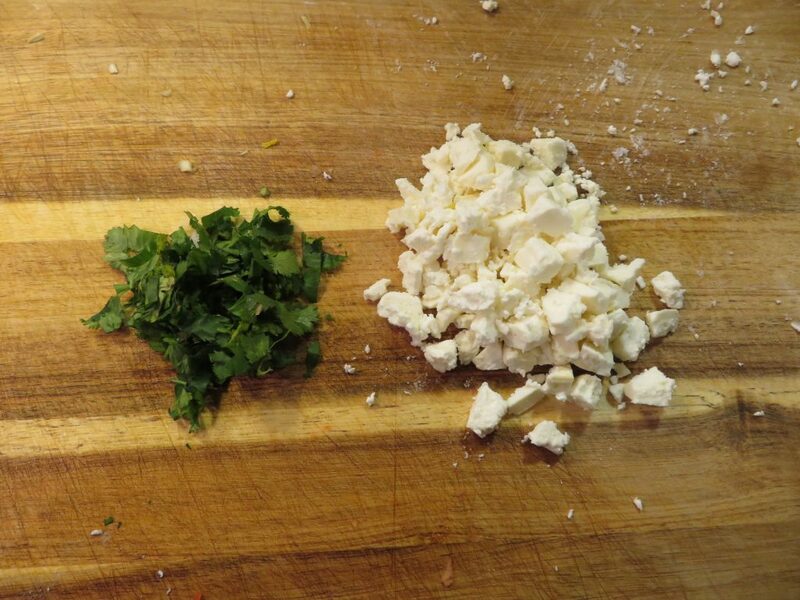 Second, I was making a half quantity of Shakshuka and so I only needed one pepper. The other things included in Felicity Cloake’s recipe but missing from my picture are sugar (I never use it in savoury recipes), lemon juice (I didn’t have any lemons) and cumin seeds (I forgot to take them out of the cupboard, but I did include them in the dish). … and the tin of tomatoes. If I cook this again, I’d like to use overripe actual tomatoes and see what difference it makes. 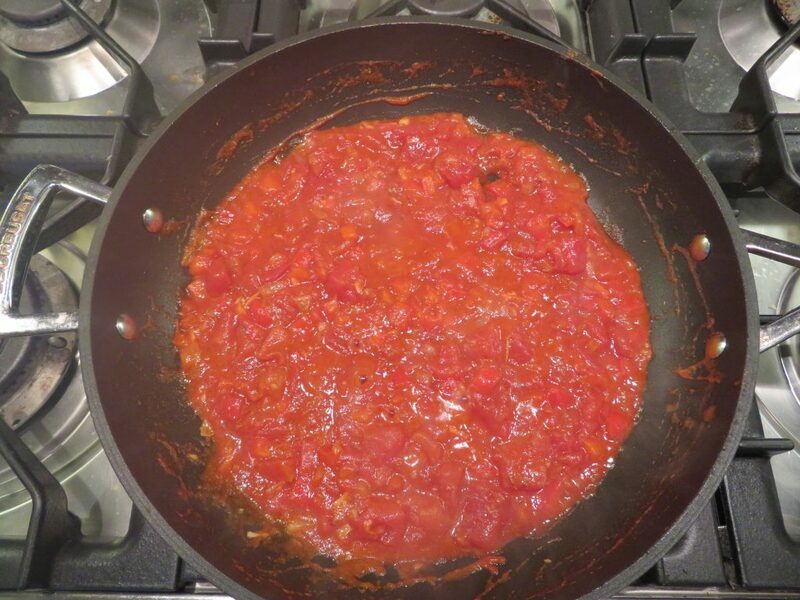 I then let that gently bubble and reduce for about twenty minutes, until the tomato sauce was quite thick but not paste-like. 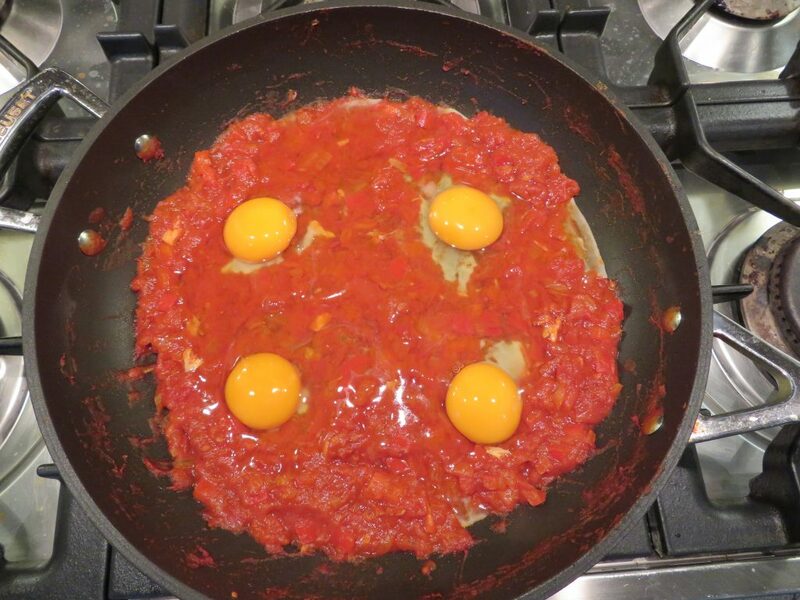 … and then popped the eggs into the tomato sauce. 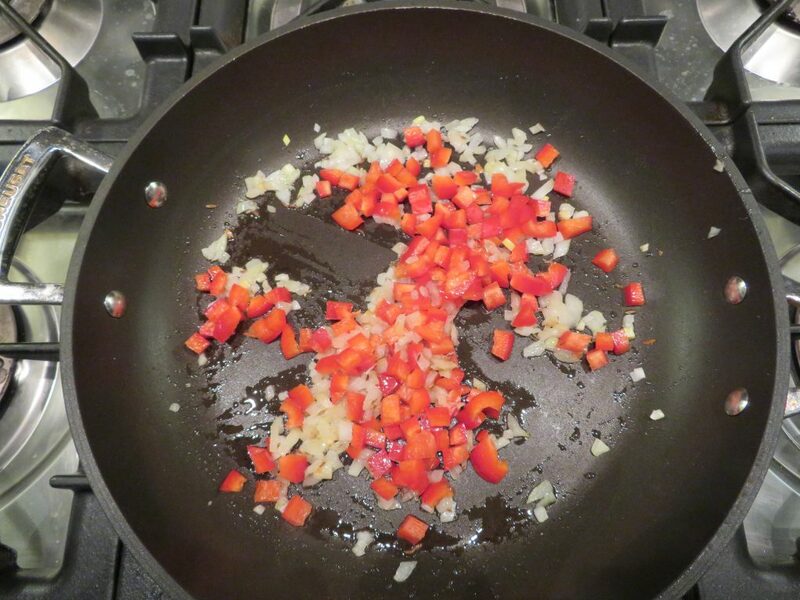 All the recipes suggest making indentations in the sauce for the eggs. Well worth doing. Eggs in a pan are pretty uncontrollable. I stuck a lid on and let them poach for about ten minutes. After that they were still a bit underdone so I gave them another three minutes. I put a few pitta breads in the toaster to warm up, made the coffee and took a deep breath to steel myself for getting the eggs out of the pan without breaking them. Such was my obsession with getting the eggs out in one piece, I kind of forgot about getting the tomato sauce out. I really should have done that first. 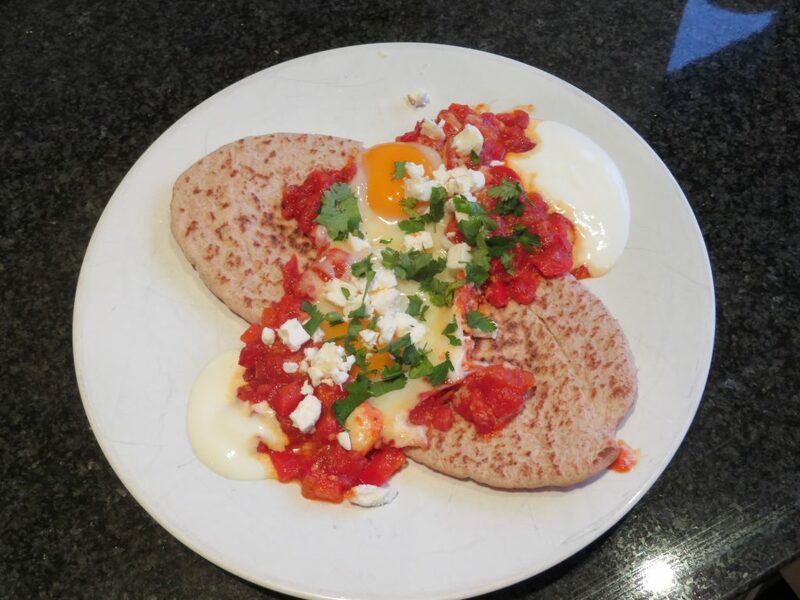 Anyway, I didn’t, so I spread the sauce around beside the eggs, stuck the pitta on the plate and garnished it with feta, a dollop of yoghurt (making labneh is on my list of culinary things to do) and some chopped coriander. The white plates don’t do the visuals of the dish any favours but what can you do (buy dark coloured plates is what I can do, actually). What did it taste like? Grand. I suppose, to be honest, it was a bit of an anticlimax. I thought about this and tried to work out why. 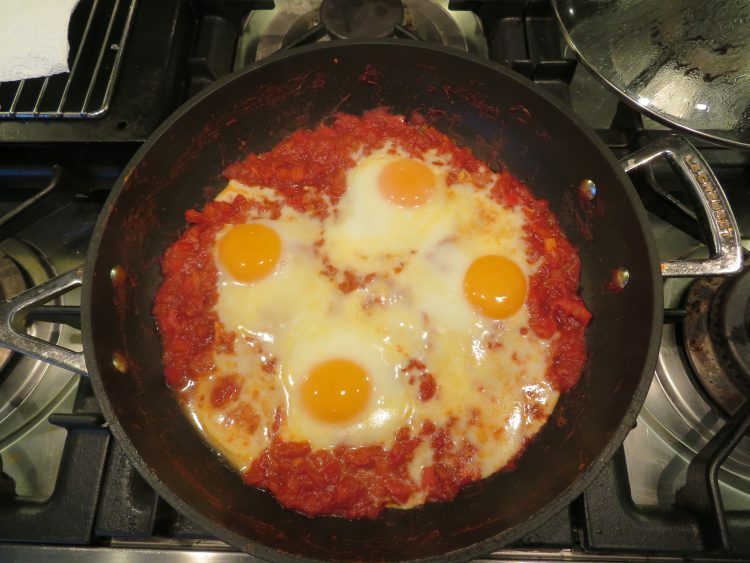 First, essentially, Shakshuka is eggs in tomato sauce. There’s no getting away from that. And that’s what it tastes like. Nice but very tomato-y. The lemon juice that I didn’t have might have have given it a bit of a welcome sharpness. And making it with fresh tomatoes would definitely make a difference but any recipes that I read that spoke of fresh tomatoes made the point that they needed to be full of flavour and overripe. The sort of tomatoes we get in this country, at this time of year, are watery and quite acidic. Secondly, and this is a bit silly really, I wanted it to look better. I’m not going to invest in individual cast iron pots but I think I will get some dark colour plates for photos of the things I cook. That’s it. If you like eggs and tomato, go for it. 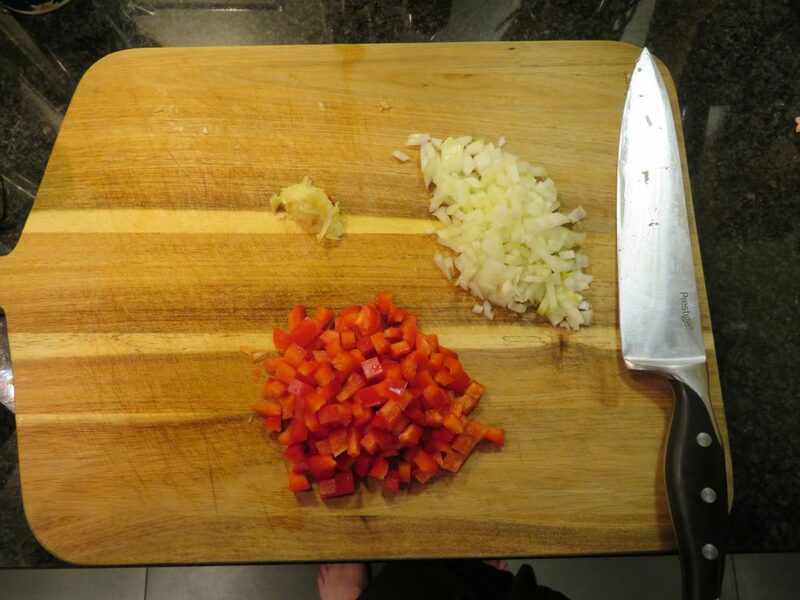 It’s easy, although it took me about 40 minutes from dicing to eating so it’s not a quick breakfast item. I enjoyed my shakshuka this morning. Thanks for taking the trouble. You are very hard on yourself, Chef David. But it is eggs in tomato sauce when all is said and done. I might try it with some sausages. Maybe Chef da Vido works better ? Claudia Roden has a recipe for it with merguez sausages.